M-KOPA, a recently announced winner of the 2015 FRP Scaling Competition, has been a widely-acknowledged pioneer in the area of Solar Home System financing. Read more to learn how M-KOPA is expanding its business model to address rural farmers’ needs through innovative financing options. M-KOPA, a leading provider of rent-to-own solar systems in East Africa, uses a pay-as-you-go model to lease Solar Home Systems (SHS) to rural customers. Customers pay a deposit of USD 35 followed by 365 daily payments of USD fifty cents, which is paid conveniently by mobile money. Each battery-powered 8W system comes with three lights, mobile phone charging and a solar powered radio. M-KOPA also offers larger 20W systems that can power large appliances such as TV’s. Since 2011, M-KOPA has provided 375,000 households access to solar energy in Kenya, Tanzania, and Uganda. 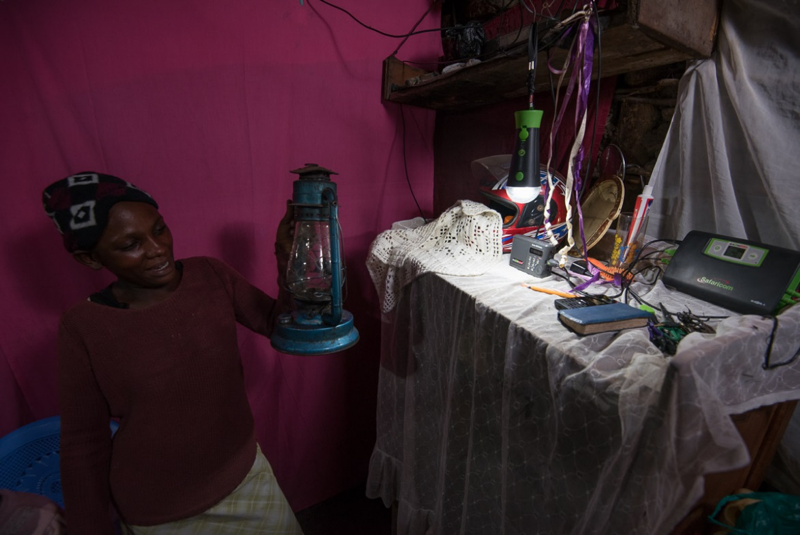 By supplanting the kerosene lights typically used in off-grid rural areas, M-KOPA is helping customers reduce exposure to pollution and incidences of kerosene-related burning accidents. By connecting to M-KOPA, each household is also able to save an average of USD 750 over a four-year period. This means that M-KOPA households will generate total combined projected savings of USD 280 Million over this time. M-KOPA has recently expanded its model with add-ons whereby dependable customers are offered the chance to remortgage their SHS in exchange for consumer finance loans. After completing the initial one-year payment plan, customers can now get more cost effective financing for a range of productive assets. These include more lights, solar TVs, energy-efficient cooking stoves, internet-enabled smartphones, and water storage tanks. Considering the SHS as collateral with intrinsic value as soon as full ownership is accessed at the end of the lease period (the ability to disable SHS systems remotely makes the them especially effective as collateral). Generating customers’ mobile repayment track record which allows the solar home companies to assess the credit worthiness of their customers and graduate those with good repayment rates onto add-on products. M-KOPA experienced early on success by offering add-ons financing for fuel-efficient stoves, televisions and mobile phones. Repayment percentage rates are in the high 90’s for the SHS and even higher on the add-ons. This shows that customers attach value to the services provided by their SHS and have a preference for the mobile money payment model. With support from the Fund for Rural Prosperity, M-KOPA is exploring opportunities to extend SHS add-on financing for agri-inputs bundled with support services. This new product would allow rural farmers to remortgage their SHS and obtain loans for procuring agri-inputs such as fertilizers, seeds and pesticides. By bundling the agri-input loans with technical assistance, advisory services, and insurance M-KOPA can improve outcomes for farmers and further reduce their risk of defaulting on the loans. M-KOPA is taking a customer centric approach to developing this new product and will need to establish progressive partnerships (to use a term from our recent state of the sector study) to address key challenges. Customer centricity: Efforts will focus on offering the most adapted, efficient, and productive agricultural add-ons to farmers. This will include gathering data, evaluating various agricultural crops, analyzing customers’ preferences for inputs or technical assistance, investigating agricultural cycles, and gauging bundles preferences and interest in group lending. Progressive partnerships: In rural areas, leveraging existing networks such as farmers’ associations, savings groups, input sales points, and mobile shops will be crucial in generating uptake. Providing bundled services will also require partnerships with technical assistance and insurance providers. Agricultural add-on financing, guaranteed by SHS, is a promising approach to reach a perennially challenging market segement with productivity-enhancing credit. We are excited to follow M-KOPA's experience as part of our ongoing research on the projects funded through FRP's Innovation and Scaling Competitions.